After this article in the Winnipeg Free Press it is clear the time for BBA has past. We’ve called for and predicted our silence before but something always kept us coming back. Those dynamics aren’t really there anymore. to say what needed to be said to keep Today’s NDP in line when they were straying. Submissions were widely submitted, editorships were edited, but it became increasingly difficult for people to reveal anything behind the curtain when the dirty laundry was aired in public. Witch doctors get worried with witch hunts being conducted. The collection of people that started this have moved on. Some literally or figuratively, others physically or spiritually. No one can say with certainty who wrote this, other than the author, and these people certainly won’t claim ownership in this climate given where we work. Ultimately, the best this post can hope for is to become a cautionary tale told in the halls and whispered in the building’s basement for those that follow. Hearing that the house leader is being chastised for maintaining a dialogue with elected colleagues he understands the premier and the caucus want to reconcile with is at best a farce and at worse a tragic comedy. They are not just turning their back on a tradition but on an ability to make informed decisions. Seems odd they would be more upset that Dave Chomiak spoke with Jennifer Howard and Andrew Swan to get things done than Kelvin Goertzen. I wonder how much retribution a government house leader faces when striking his next deal with the opposition? If Greg Selinger can’t lead his caucus and defers to Rob Altemeyer in this how can he claim to lead the province on any decision without Wolseley’s permission? Seliger’s first leadership slogan was “Ready to lead”. He asked the party to grant him that opportunity. We still wonder if he will ever step up. But these sorts of things aren’t unique here. They are only unique to a caucus, party and government in turmoil. Echos of Pawley and Filmon can still be heard in the halls for those willing to listen to those cautionary tales. The FreeP article is really a clear example of a surprising abdication of decision making power and the lack of leadership and accountability that was and is there now. It also speaks to an arrogance and willful ignorance that is dangerous not only to the elected officials but the people they represent. There is no surprise the internal fighting is continuing. 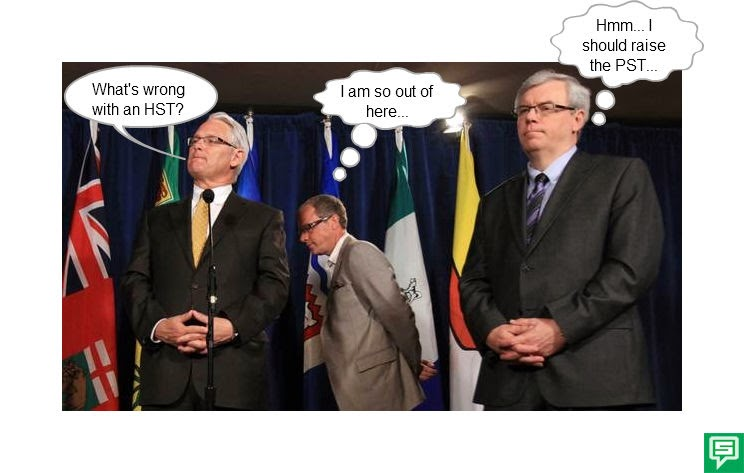 The only thing Premier Selinger and “his team” learned from the leadership was “Everything I/he did was right”. They won, the party told them so. In some ways, the instant the dissenting MLAs were removed from caucus the course was set and the echo chamber complete. There are countless comparisons that can be made. The bad break up is a solid example; however, it fails to grasp the absurdity of the situation. The visual we would paint is of an NDP misinterpretation of a Mccarthy era tribunal with Monty Python elements thrown in for good measure. Just think of it: The MLA for Wolseley, MLA for St Norbert, and the Premier presiding and cross-examining MLAs.“Prove to me these matters 3 your nomination papers signed you’ll see.” Who can eat more granola? Who is more blue collar? Who can take a more principled academic stance? Get all three right and you get to be part of NDP Caucus until 2016 when Manitobans can have their say about your part in increasing their taxes. Everyone has a choice, even in these types of absurd situations. Greg Selinger could have worn the decision to raise the tax, resigned, triggering a leadership contest allowing the party to rebrand and rebuild prior to the next election. He could have contributed to them having a fighting chance. He chose, based on undefined principle, to stay on despite his unpopularity and dragging the party down in the polls. The dissidents could have remained silent knowing they were going to see many of their colleagues, and an organization they worked hard to build and contribute to, fail. 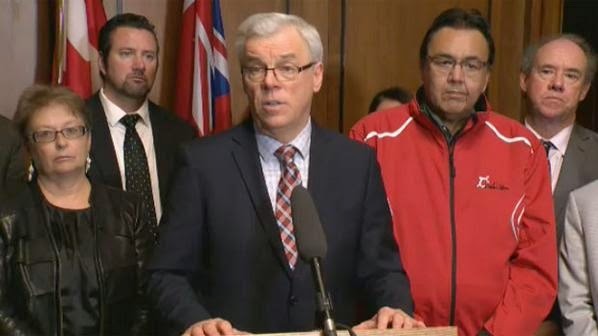 They chose to act and call for a leadership review knowing that they will be blamed for any possible defeat by Selinger’s supporters and much of the NDP for the foreseeable future. Of particular note, Alex Forest and Paul Moist could have put the long-term benefit of a labour-friendly government and union members first. They chose to gamble that with short-term backroom deals and ideological positioning, which may leave the very workers they purport to represent more damaged in the long-term. All this to claim the personal title of kingmaker. And every NDP member had a choice casting their ballots whether to be conservative and support the status quo or progressive and change. A slim majority chose the status quo. The Premier is the ultimate judge and jury to sign the nomination papers. Every elected official faces these decisions periodically for a variety of reasons. Inadvertent pen clicks, dissident labels, unpopular decisions in the public eye, the countless personal sacrifices. An old adage “the worst day in government is better than the best day in opposition” is often used to help incumbents focus. The tragedy comes in the level of denial and self-delusion needed to convince yourself a romanticised version of the past is better to keep fighting for than a self-determined future. If this relationship is no longer working it becomes a matter of individual decision for each MLA on some simple dynamics that often get overlooked. Do I still have the ability to affect the change that got me involved with politics to begin with? Do I still have the ability to represent the members that nominated me? Do I still have the ability to represent the constituency that sent me to the assembly? If the last few months were fun will the next year be any better? What is the personal cost and benefit of staying for another year and losing or winning compared to leaving now? If they answered no to any one of these or the costs outweigh the benefits maybe they should let someone who wants to do it take their best shot. While there are broad ranging implications for the organization if resignations trigger a by-election, particularly prior to a general election and what those can mean, the net harm from the by-election is on par with the gain for the organization in preparedness and would ultimately prove a net benefit to the electorate gaining a functioning elected official able to work with and in a caucus. For staff its a matter of asking “how high?” when they ask you to jump knowing that the tallest blades of grass get cut first by the lawnmower. I’m not counting the NDP out of the next election. As staff we turn up everyday to get the job done until we chose not to. There will be countless hours spent before and during the next election. Many are hoping to show up to work the day after e-day and continue to make a difference and improve the lives of all Manitobans. Sometimes to do this we need to be reminded of what the meaning is behind leadership, accountability and choice. Even when a government, party or MLA forgets these things, voters seldom do. Some will chose to stay. For some it’s time to go. And, in this case, it’s time to fade to black. We have written previously about the art of political exodus. It ain't easy, that's for sure. And with the events of the last week, we couldn't resist adding some thought bubbles to this photo. The 900 or so people attending last weekend's Premier's Dinner heard Mr. Eric Robinson unreservedly endorse Premier Selinger as a great friend and supporter of First Nations people and communities. Does this rhetoric really align with reality? Remember this press release from 2006? We won't reproduce the entire thing, but have retained a key quote from former Premier Gary Doer who very rightly pointed out the travesty of northern Manitoba communities not having access to clean water and sewer systems. The former NDP Premier made the point that modern water and sewer systems are not only critical to good health, but are also a matter of "basic human dignity". Here's the Free Press' coverage of that news release. Fast forward eight years. Eight years later, who ends up getting a $45 million water treatment plant? The people of Garden Hill? Nope. Stony Mountain convicts and CentrePort. Don't get us wrong... convicts and empty industrial parks need love too. None of us could possibly sleep at night knowing industrial parks and convicts were being denied their "basic human dignity". Clearly, this stuff matters to Manitoba families. Mr. Robinson does not normally mince words when it comes to sharing what's really on his mind. Just ask the people of Osborne House. We find it difficult to believe he supports a $45 million water treatment plant for an industrial park and convicts when many communities in his constituency struggle to attain and maintain access to clean, running water. Which makes us wonder why Mr. Robinson would so unreservedly endorse Premier Selinger as a friend and supporter of First Nations people and communities. Is something else going on here we don't know about? Why the unwavering support for a Premier so soon following what should have been a drastically divisive political decision for Mr. Robinson to swallow and defend to his constituents? As for Garden Hill - a community of 3,800 mostly without proper drinking water where elders are still forced to use outhouses in extreme winter weather - hang in there folks... we'll get to you once our industrial parks and prisoners are looked after, and Mr. Robinson and Premier Selinger find a way to align their rhetoric with reality.